Readers of my blog, QuiltDad, know that I have a huge aversion to handwork, but I love the look of projects that feature hexagons. So I came up with a method that allows me to incorporate hexagon designs into my quilts without any handwork at all! This mini quilt project is a fun way to practice the technique, and the end result is perfect as a wall hanging or table topper. This project features the gorgeous new fabric line Indian Summer by Sarah Watson for Art Gallery Fabrics. Assorted scraps of Indian Summer fabrics. 3 hexagon templates in different sizes, printed on a heavy cardstock paper. 2 pieces of fabric -- either whole or pieced -- measuring approximately 20” x 24” each. These will be your quilt top front and backing. A scrap piece of batting measuring approximately 20” x 24”. 3 strips of a binding fabric measuring 2.5” x 42” (selvage to selvage) each. 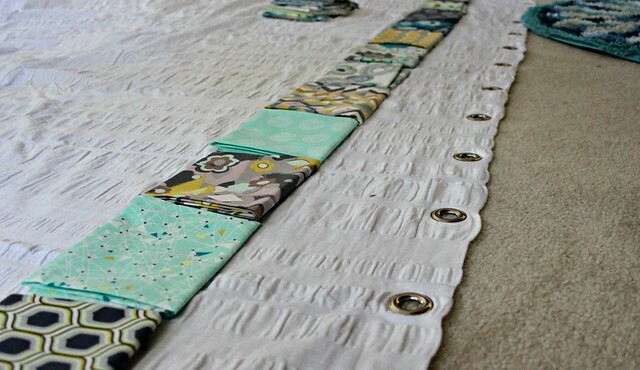 1 Baste your front and backing fabrics with batting inbetween. Quilt your quilt sandwich as desired. I freehand quilted a herringbone pattern that is reminiscent of one of the prints in the Indian Summer line. 2 Create your hexagons. With a small ruler and your rotary cutter, place a hexagon template on top of a print fabric and cut 1/2” around the template on all sides. 3 Fold one edge over the template and press well. Work your way around the hexagon, folding and pressing each edge as you go. 4 When you have made your way around the entire hexagon, turn it over and press again from the top. 6 Repeat steps 2-5 to create a variety of hexagons (in both size and print) until you have as many as you’d like to use. 8 Once you have placed and sewn your hexagons in an eye-pleasing arrangement, bind your mini quilt. I hope you enjoy this quick and fun little project! If you make an Indian Summer mini quilt, I’d love to see it. Please add it to the Quilt Dad is my Homeboy Flickr group (http://www.flickr.com/groups/quiltdad/). As always to be eligible to win you must follow AGF on your fav social media platform (Pinterest, Facebook, Twitter)and Subscribe to our blog to stay up to date on all things AGF & the Fat Quarter Gang! And, don't forget to stop by Quiltdad.com to win your very own bundle of Indian Summer!!! Hi! I'm Amy aka Sukie from Sukiedontyaknow.com. Wow. . can you believe it's been a whole year of the Art Gallery Fat Quarter Gang?!?! 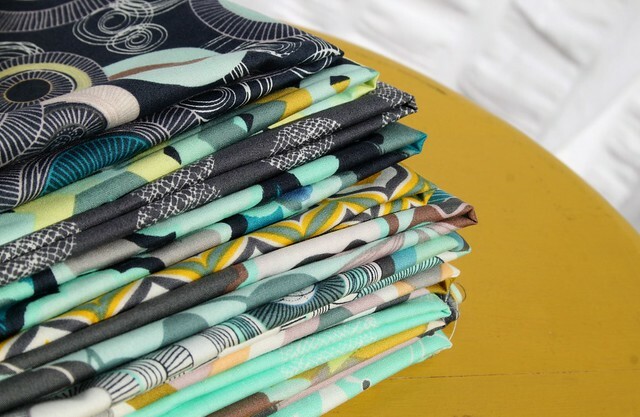 9 Pure Elements Fat Quarters (*you can get away with using fat eights but these solids are versatile in any project). Give this project a go and please be sure to join and add them to the Fat Quarter Gang Flickr Group! And, don't forget to stop by my blog to win your very own bundle of Pure Elements!!! Happy Monday everyone! It's Maureen here again from Maureen Cracknell Handmade visiting with my newest Fat Quarter Gang Project! 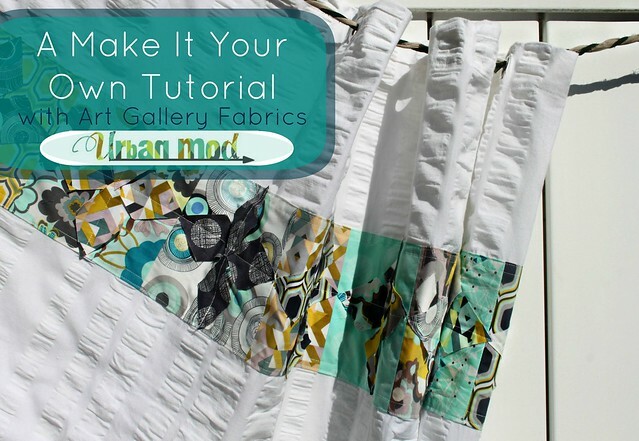 This time I'm sharing a "make it your own" tutorial for an Urban Mod Shower Curtain, using a store-bought white curtain and giving it some Urban Mod style with some fun patchwork and raw-edge applique! a white cotton standard shower curtain measuring 72"x72"
1. Using all twelve prints, plan out the fabric order for the patchwork panel 2. Using a cutting mat, ruler, and rotary cutter, cut a strip measuring 7"x18" from each 3. Then cut a 7" square piece for that strip, keeping the fabric order for the patchwork panel. Repeat with all twelve Urban Mod prints. 7. To hem the short end of the panel, fold edge in 1/4", press, fold 1/4" again, press, pin, and sew along the inner edge of that fold. Repeat for both short ends of the panel. 8. To hem the long sides of the panel, fold in 1/2", press, pin, and sew along the inner edge. Repeat for both long sides of the panel. This is an optional little extra something! 11. From the fabrics leftover from cutting your 7" squares, cut 2 - 2 1/4"x7" pieces of each of the twelve fabrics 12. To make the diamond template for your applique, draw a 3" line onto the cardboard, in the center of that line draw a 2" line, and connect at all points to make the diamond. Cut this out. Voila! Your "make it your own" Urban Mod Shower Curtain is complete!! I hope you enjoy this new tutorial!! If you do give this project a go, please be sure to join and add them to the Fat Quarter Gang Flickr Group! Feel free to share on my Facebook page or in my Maureen Cracknell Handmade Flickr group, as well! And, don't forget to stop by my blog today for an Urban Mod Giveaway!!! It's Katy from I'm A GingerMonkey here with a new tutorial for the Fat Quarter Gang. My project is really simple drawstring back pack. You can download a PDF to keep on your desktop and print whenever by clicking here. 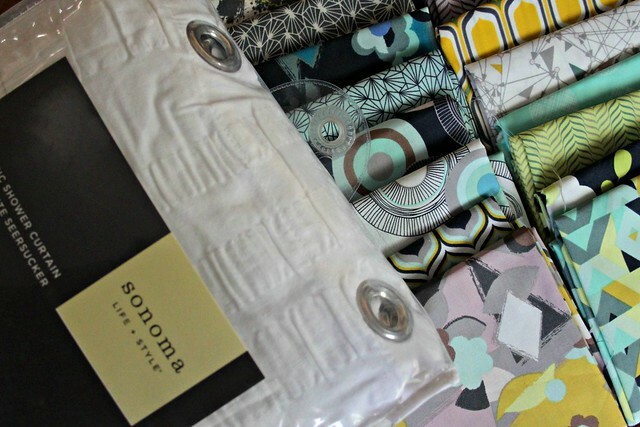 Jeni's first line for Art Gallery Fabrics is absolutely perfect for so many uses. I love the retro feel of the prints, and the bright colours. I knew I just had to use it to make this project. The Jeni bag is the perfect size for a child's backpack, but it's also a good size to pop your essentials in for a trip to the gym, or if you're not much of a gym bunny, use it as your everyday bag. I've already got more planned - I'm thinking of using them as laundry bags for my kids' rooms, to use instead of wrapping gifts for birthdays, and for Christmas wrapping as well. They're really simple to make, and don't take long at all. There's nothing complicated, just straight line sewing and some bashing of grommets for the ties. For a chance to win a bundle of Color Me Retro by Jeni Baker, head on over to my blog and leave a comment. You can get an extra chance if you follow my blog, just leave a second comment letting me know, and for a third chance to win - follow Art Gallery Fabrics on twitter, or facebook, or the blog and leave me a comment to tell me so. I'll pick a random winner in a week! I’m Faith Jones of Fresh Lemons Quilts and I'm very excited to share my 4th Fat Quarter Gang project with you today, the Mod Stack Placemat. Download Mod Stack Placemat for the full tutorial. 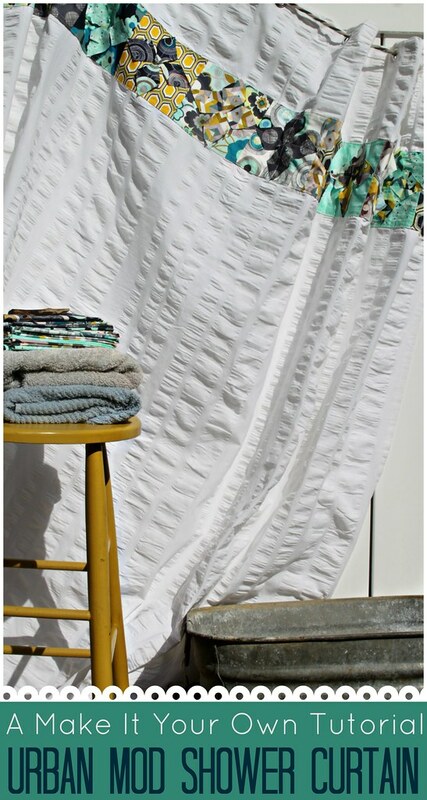 This is a fun and easy project to throw together for a fun afternoon sew. Now, want to win your very own fat quarter bundle to complete this project? Enter to win over at Fresh Lemons Quilts by leaving a comment. 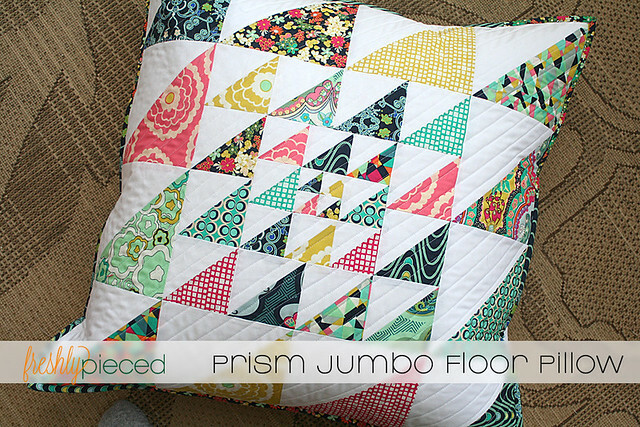 Hi everyone, it's Lee again from Freshly Pieced, back with another tutorial for you all—this time I'm showing you how to make this giant "Prism" Floor Pillow in Art Gallery's fun new Carnaby Street line. 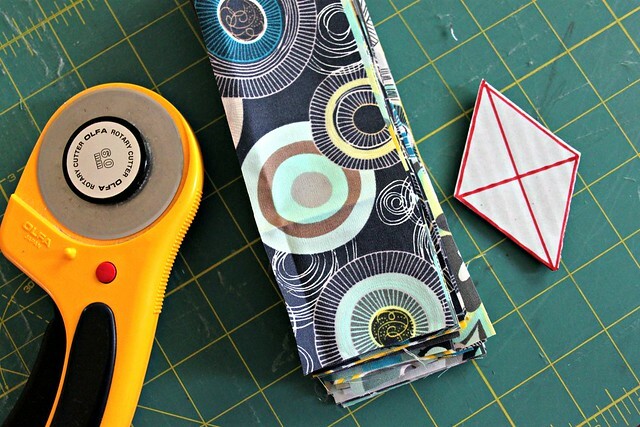 Save your remaining scrap triangles for other projects! - 1 piece 12" x 24 1/2"
- 1 piece 18" x 24 1/2"
2" triangle units = square up to 1 1/2"
3" triangle units = square up to 2 1/2"
4" triangle units = square up to 3 1/2"
7" triangle units = square up to 6 1/2"
4. Lay out your finished HST units as shown in the diagram above. The smallest 1 1/2" HST units are laid out in the center, in two rows of 2. The 2 1/2" HST units surround the 1 1/2" units. The 3 1/2" units surround that, and the 6 1/2" units surround that. 5. Join the 1 1/2" HST units into two rows of two, then join the two rows together to make a 2 1/2" finished block. 6. Join the 2 1/2" HST units together as shown, with the smaller pieced units at the center. 7. Join the 3 1/2" HST units together in sets of two, as shown, and join to each side of the center unit. 8. Join the remaining 3 1/2" HST units together in two rows of 4 units each, and join to the top and bottom of the center unit. 9. Repeat steps 7 and 8 using 6 1/2" HST units to complete the pillow top. 10. Layer the pillow top with the batting piece and muslin backing. Quilt the top however you would like—I quilted in straight diagonal lines. 11. To make the pillow back, take the two pillow back pieces (12" x 24 1/2" and 18" x 24 1/2"). On each piece, fold one of the 24 1/2" edges down 1/2" and press. Fold down 1/2" again and press. Sew the hem 3/8" from the folded edge. 12. To make the pillow trim, cut 2 1/2" wide strips of fabric from the leftover Carnaby Street prints. (I used strips from several of the darker Carnaby Street prints.) Sew the strips together end-to-end until the strip measures about 120" long. Press the entire strip in half lengthwise, as shown. 14. Now flip the whole thing over and add the pillow trim you made in step 12. This step is done exactly like quilt binding—lay out the binding around the perimeter of the pillow top, mitering the corners. Remove the pins you added in the previous step and repin everything (pillow trim, pillow cover, and pillow back pieces). Sew around the perimeter of the pillow using your favorite quilt-binding method. 15. Fold the binding around to the back of the pillow, just as you would do with quilt binding, and stitch down onto the back of the pillow using your favorite machine-binding method. 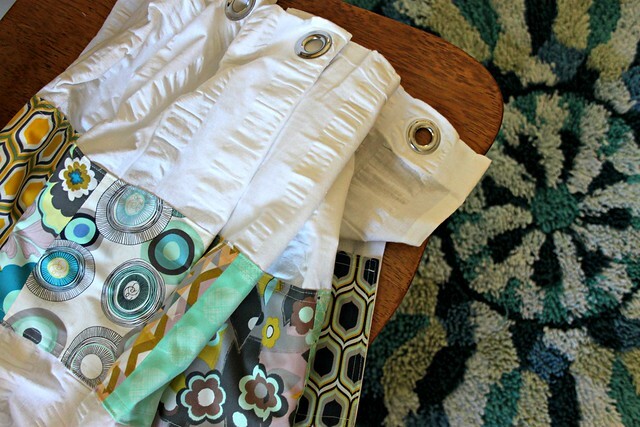 Here's a great machine-binding tutorial by Allison of Cluck Cluck Sew. You can also hand-stitch the trim to the back of the pillow if you prefer. Now just insert your pillow form and you're ready to enjoy this jumbo-size pillow. It finishes at 24" square (and requires a 24" pillow form). Hope you liked our project today—stop by my blog, Freshly Pieced, for more tutorials and patterns. leave a comment for a chance to win. Giveaway open until March 15th. date on all things AGF & the Fat Quarter Gang! Ohhh... and let's not forget Flickr!